In David’s vlog, “Decisions, Decisions,” we heard him express his joy at finally having the freedom to make music in his own way and in his own time now that he is free of label constraints. Although we don’t have all the gory details on exactly what went down resulting in David opting not to renew his contract with JIVE, he’s made it clear that one overriding factor is having complete creative control of his music and the direction his career and his life will take. I think there is much David wants to say to the world and music is the vehicle he has chosen to share those thoughts. Now that label and management are out of the picture for the moment, David is free to write, and write, and re-write, to assure himself that his thoughts are interpreted in a way that accurately expresses how he feels and who he is as an artist. I’m looking forward with great anticipation to what David has in store for us musically. I can’t wait to hear the melodies he will create to go along with he messages he wants to share. But there are many things for him to consider during this time. Decisions will need to be made as to when the time is right to sign with new management and label, and whether to write completely on his own or if teaming up with good quality writers for some of the songs on his next project would be the right move. Also, in regards to time away from his fans and the public, how long is too long? One of the most difficult things to do in the coming months may be for David to find balance. He does need time for a personal life and to write his music, but not necessarily to the exclusion of everything else. During this time, he could still make himself seen and heard, maintaining a presence in the fan community and in the music industry. There are ways that he can do this. First: It would benefit him to get himself out there, on stage, performing from time to time. This will accomplish two goals. 1) It will feed his hungry fans by way of live performances, videos, photos, and anticipation of upcoming events. 2) I think it will also help to assure that when he releases new music there is still enough interest by the media that they will pick up on it and spread the word. The announcement of the Stadium of Fire performance indicates that he can indeed do concerts without a label. This is good news and my hope is that we will see more and more performances being announced. Next: Staying in communication with fans. He recently tweeted about how “communication is key.” I hope he keeps that in mind in the months ahead. This will be crucial in keeping his fan base intact. Vlogs, blogs, and the occasional photo or video of him writing/recording will help to keep us informed about what he’s doing and keep us entertained while his creative juices are flowing. (Or even a leaked song, by the man himself! How cool would that be?) He would be keeping the excitement alive for his fans and maintain that connection. I admit this may be a purely selfish perspective on my part. We are a hungry lot and we have been spoiled. “Music fans are getting more and more accustomed to instant gratification. They want to feel connected to the process and the progress – not JUST the finished product. Waiting a year or more to put out the “perfect collection of songs” all at once could actually be costing you. But with CD Baby’s new singles program, you can release songs one-at-a-time getting them up for sale right as you finish up with each track. David has many options on how to proceed from here. Whatever he decides to do, I’m sure he thought long and hard about the move to release himself from the constraints of having to satisfy a record label with every move he makes. I just hope he is able to find that balance between taking some much needed time to figure out where his life and his music are going and maintaining a public presence while he works it all out. After all, it’s all about balance. 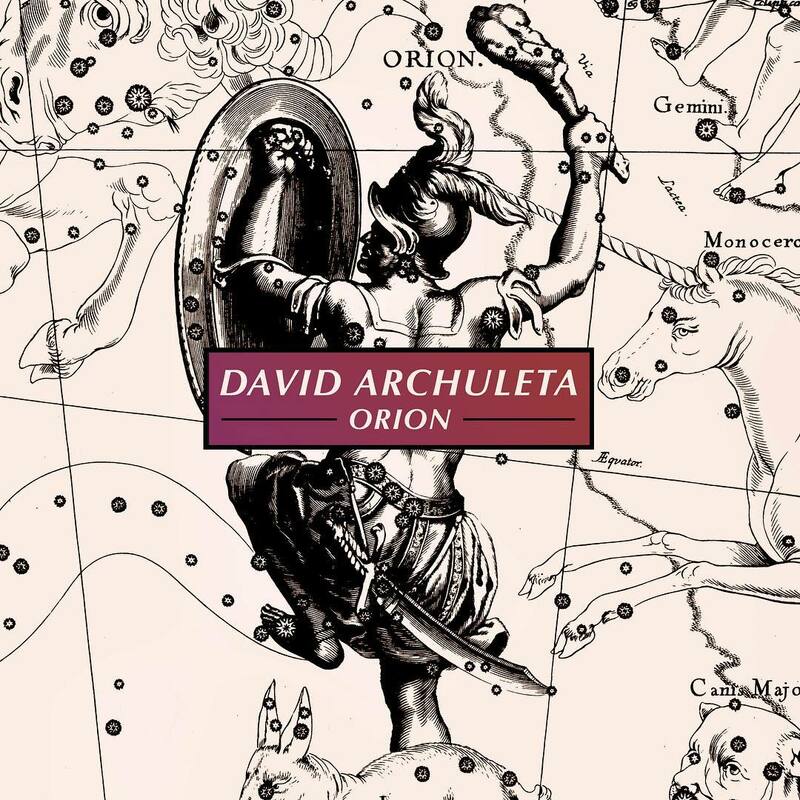 This entry was posted on Wednesday, March 23, 2011 at 11:20 PM	and is filed under artistic freedom, Balance, David Archuleta, Matt Clayton Photography, music, Personal freedom. 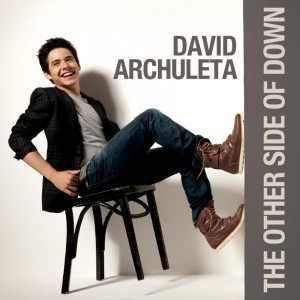 Tagged: ‘Cause you remind me of a Ballerina dancing on a wire, Balancing act, David Archuleta. You can follow any responses to this entry through the RSS 2.0 feed. You can leave a response, or trackback from your own site. In his last vblog, David spoke of building a foundation. The next day he flew back to California to begin auditioning a new band. This leads me to think that he has found management. The only appearance we have been made aware of is the Stadium of Fire concert in July. Hiring a band this far ahead is a sign he has more gigs in the immediate future. Once he has his ducks in a row, with a band and some dates to perform, he will let us know. David is a very methodical man. His Facebook page has been updated to reflect a Band Page. This is part of the foundation building I am going to watch closely. 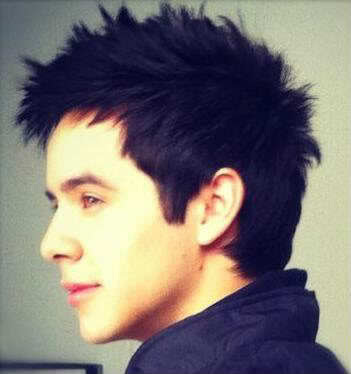 David is definitely on the fast track in getting back to focusing on his music career. I saw this on twitter last night http://tinyurl.com/6xdmfws Anoop Desai is taking a step forward to get funds to support his career as an independent artist. It’s a bit extreme IMHO, but he is doing what he can to get his music out there. This is the FAQ about Kickstarter http://tinyurl.com/4hwtm5f It’s good to know there are options for any art form to get funding. Firefox has a new update to Firefox ver 4. If you don’t like changes in how your browser looks, I suggest you ignore the update until you are forced to do it. It’s not drastic but I did need to do some tweaking, http://www.tweakguides.com/Firefox_1.html to get things how I wanted them. Sandybeaches, I was going to comment today on your article and then BAM! there was a new one! I’m posting this here to be sure that you see it. Thank you for that beautiful journey! I don’t know how to explain the glory nor the majesty of horses (or of David). My sister has always loved them. I used to draw them when I younger. We are always trying to be balanced, but I believe that we can be rest assured that David has all that we are hoping for in his hands. I agree 100%. We cannot be left hungering for too long. While we are here for the long haul, David must understand that patience must find some satisfaction and reward or it goes away and becomes frustration. We can be patient, but we do need to hear ‘something’ from his talented, artistic self. His vblogs with random banana trees and gorillas in closets keep us entertained, but not necessarily sustained. I can understand the need to keep his business dealings quiet until, as Abrra said, he has his ducks in a row, but some blogged vocals would be a very refreshing drink of water in this drought. Great article! Life is all about balance, and our David has been so giving to us fans! Thanks, MT for your thoughts! Have you seen this video from Rising Star Outreach? What an amazing organization with an amazing your man in the video! …the singles route “The Incremental Album” speaks of. Comments were very interesting…and it certainly may be the new way of doing things for independent artists.Is that David now? I was of the mindset, that David would most certainly be a sought after commodity, after leaving Jive, by those who know full well.. and appreciate, what he is capable of. But then, he may have had offers we don’t know about yet from a recording company, and new management we don’t know about yet. Face it, we know very little. I wonder alot about TOSOD and everything that was produced under Jive.Can he put on a concert of all of those songs? Or the first album? 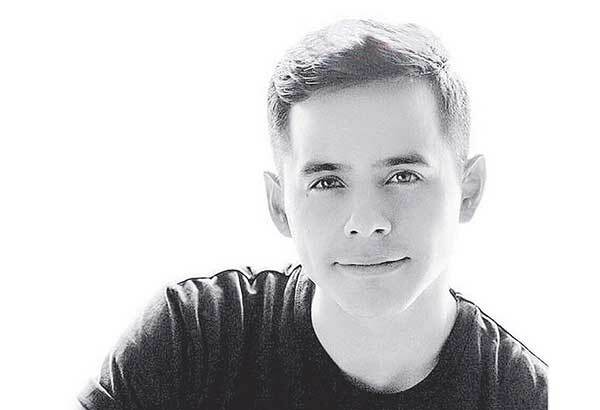 Will David not perform full concerts until he has new material? I just wonder,about TOSOD, because I think it is SO good. I know only this much..David is a man of his word,he knows we want his voice,his music, and I think he truly does know he has a potent GIFT! I feel like he will collaborate with other musicians/songwriters or whatever it takes, to say what he wants people to hear, on top of writing himself. How it will all come together, I don’t know,but we know he is working on it. 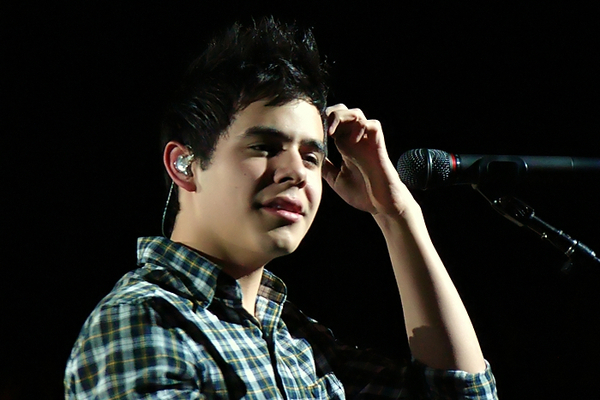 I have questions, just because I want to see him perform again… sooner than later,but I trust the Archuleta. We have so much to look forward to from David, and I can’t wait! Ummmm….obviously I meant young man….not your man…although that fits too…. He can sing any of the songs from any of his Cd’s. Everyone benefits when he does . Jive still gets their share of royalties. Honestly, I think David has it all under control. Being a fan from the beginning has taught me that he’s methodical, analytical and a quick study. He’s sensible enough to put good advisers around him and to get rid of them when they’re not working on his behalf. His long time advisers haven’t steered him wrong yet. The thing is that he has spoiled us by making us privy to more than other artists do for their fans. And now there are some who think they’re entitled to know everything, even before it happens. Not so. David is an adult now and a businessman, in control of his destiny. I’m confident that he will make the right decisions to lay the foundation for the tower that will enable him to reach his potential. All he needs is time and space; a small price to pay for all we’ve received from him. Artists change labels all the time. I’ve never heard of them not being able to sing the songs they’ve recorded on previous albums. MT, You did such a good job of bringing the concept of options and balance to light. Keep writing, please. I find myself pondering… are we going to be inside or outside for the next vlog?Like the outside lighting ☺, but LA HAS been rainy. ABRRA So glad you mentioned Firefox 4! Last week I mistakenly “updated” and without getting into it all,for me personally ,it was several hours before I got my problems resolved.It was a mess. I put a link to the FAQ page for it in post #3 if you need any more help. I don’t mean to say its a bad update, just different. They moved some things on the interface and some things had to be reset from options. I am fine with it. I did want to warn others who may not want to have to bother with all the changes. Its still the best browser out there. The only problem I had was the menu that goes across the top was hidden. I got that resolved by looking it up. Paula, I looked for the source of David’s quote about being kind and courteous but failed to discover it. It’s a great one as is your similar advice for your daughter. This is such a well-stated, thought provoking article on a subject that seems to be a lot on peoples’ minds these days. How do we respect his space and still find a way to understand what is going on with his career? TOfan has a great article up right now on SnowAngelz that speaks about this situation. It’s a balancing act for both David and his fans. I think we can all agree that going on twitter or any public forum to demand anything from him is asinine. As is asking any former employee of his to divulge information about him. So I like the way you respectfully point out the pros to keeping his fans in the loop. His die-hard fans, as you say, are not going anywhere but we want to feel a part of the process. We want to cheer him on and be, besides his family, faith and friends, another vital support system for him. I think he understands this and will do his best to find that balance between his privacy and his PR. Many artists would love to have the intensely loyal, fanbase that David possesses. That is a real asset in a music career that many have to work for years to acquire. I think he understands this too but like the feeling he had when he was freed from the constraints of his label, we have to give him room to breathe. I love the idea of him doing an EP or singles at intervals, letting the fans give him feedback. I also love the idea of doing vlogs in the recording studio occasionally to bring us along with him during the process. The internet has opened up some exciting ways to bounce off the trampoline that a great fanbase can be. We are here to support him and catapult him higher and higher if he will let us. I am happy to hear there is a new blog on the way soon. Not gonna lie. I love seeing or reading or hearing anything from “our” man. Thanks MT for the article on balance!! ….and of course the pictures and tags!! Loved the video of Rising Star. Fun to see David playing basketball and jumping Zero Gravity like! Looking forward to the Vlog! ( not counting on news ) ……but hoping for news. I agree with Abrra. I think David has management and is preparing for tour since he is auditioning band members. He wouldn’t do that in California just for Stadium of Fire. (He could have done that in Utah) I also would not be surprised to see Ray as Tour Manager again sooner rather than later. I also think he had some things in mind before his decision to leave Jive etc. Jan, Marylee, Abrra, FG, Tawna, Paula, Sky, BeBe, Angelica, Heidijoy, It’s great to see all the interesting takes on the article. Yes, our ODD has us all sitting on pins and needles. It definitely has me thinking and it will be interesting to see how it all plays out. 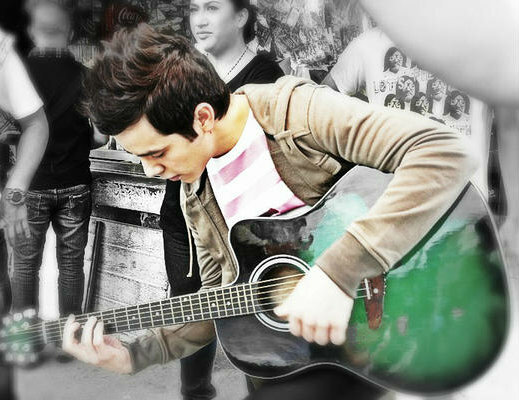 As for him putting out an EP ♥ or vlogging from the studio ♥, I know we can’t expect anything, but we can certainly hope!!! ^ ^ I soooooo hope you are right, about management and appearances coming up. Keeping my fingers crossed. ^ ^ It is absolutely a balancing act for the fans as well. We all have at least a bit of ODD or we wouldn’t be here talking. We are trying to be patient, because we understand that he needs time, but we can be impatient as well. I don’t know about you guys, but I keep flip flopping on that one, depending on the day. And I love that stop sign!!! Yes, totally agree on that too. And thanks to Angelica for choosing those AWESOME pictures to go with the article. Tawna, hope you enjoy concert and your weekend! I’ve read and will comment later and your great article but these tweets are making me spazz!!! And I might see David Saturday!!!!! 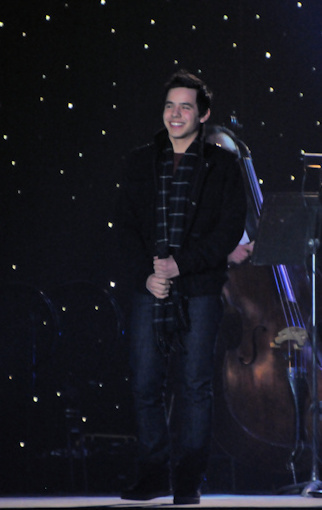 Great to see @DavidArchie yesterday! Don’t forget to pull the rip chord!!!!! Just saw David archuleta from idol at portos ! Haha! Just had a thought after reading EMan’s tweet. Could David be parachuting in to sing at NASCAR? Oh My Gosh Abbra. ROFL!!! This came in my mail tonight. This is the official live app (iPhone) for McFly Live at Wembley Arena. e-ticket iPhone App, designed to allow all fans who can’t make the Wembley show on the current tour to watch the gig live on their phones! Imagine if we could pay a ticket fee and watch David at selected tour venues? dja, you might going to the race! Ladyv, how did WHAT go? Eman, he could be a professional tease. Better get my DVR set to record. MT, great piece. Balance – what we try to achieve in all areas of our life. Tis a good thing. 20 Abrra, now that would be cool, if he was a seasoned jumper!eeeek! Last week it was a blimp ride, is he going to jump out of an airplane next!? eeeek, again! A few weeks ago, The Monster Truck show, & now NASCAR? Seriously though, I love hearing David sing the NA, no matter what the event is. 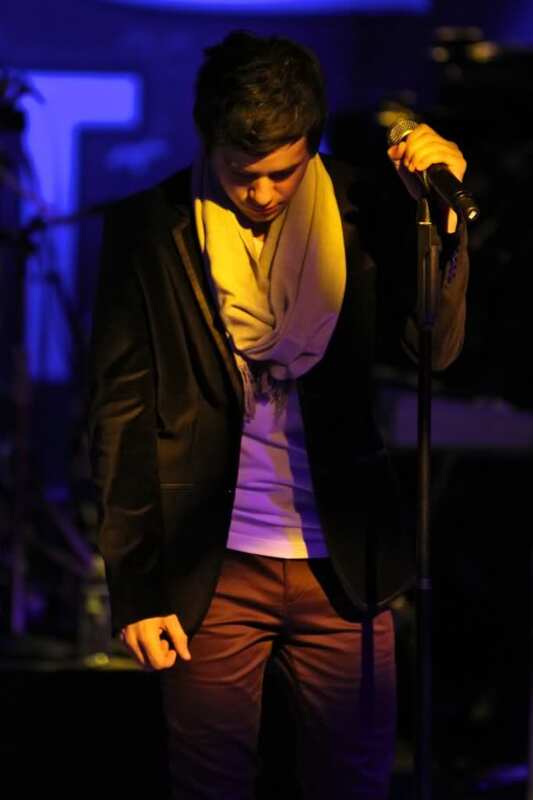 No other singer can touch his rendition. He kills it every single time. There will surely be chills & thrills not only during the race, but as soon David sings the first note! Angelica ,I especially like your point right before the stop light. No one should scold David and fans should not engage former management and former management should be more professional. skydance, I KNOW! Can you imagine him parachuting in and then belting out the NA! Could it be!!! SF, lol! Maybe now that he is free of the label’s shackles he is just going for it! Funny how we can take one little tweet and let our imaginations go wild. MT- I think the balance thing will emerge once he gets on the right track–both with fans and career versus private life. As I said a couple days ago, I feel he already has management and is almost ready to go forward–but he’s really sneaky. Yes, SF, first monster trucks and then NASCAR. Who IS this redneck Latino indeed? On the bottom picture of the article there is a very evident what he calls a farmer’s tan. Back in these parts, we call that a redneck tan. haha. Word. dakgal, “Well Abs, looks like you and I are out as far as being considered to be his girl friend, as we are afraid of heights and he likes a girl to be adventuresome (along with a hundred other reasons that I won’t mention.)”…LOL!!! My imagination is going crazy right now…Parachutes and Airplanes! Angelica, can’t find the pic of the farmer’s tan. Which link? 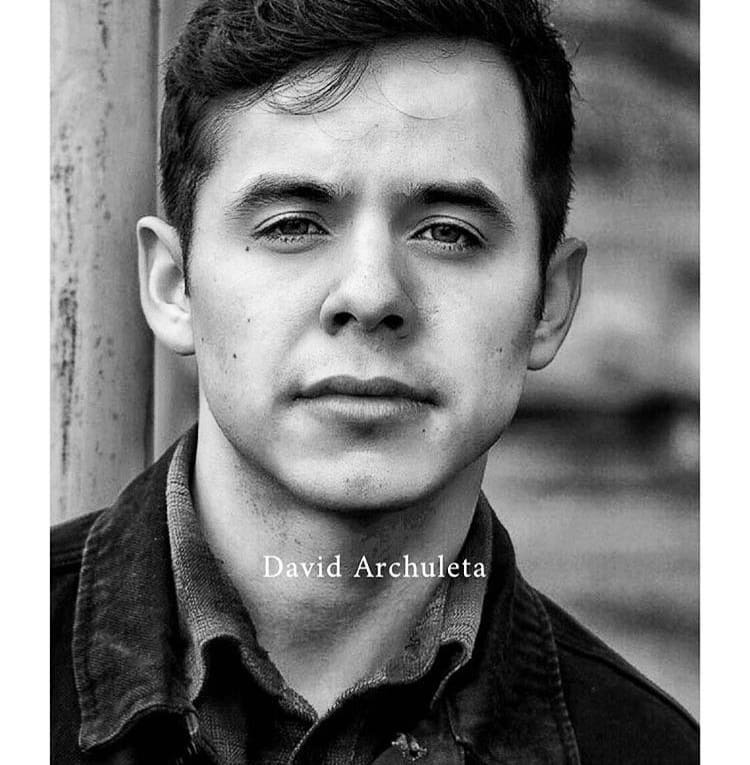 Who is this “Latino Redneck” & what has he done with The Voice, David Archuleta? I know one thing for sure.Nobody loves a good National Anthem singer like NASCAR folks. They are gonna love David! You are absolutely right, he will give them chills and thrills. THAT, dear Abrra, would be wonderful! Thanks guys. Another gravity defying feat. OMG I leave for a few hours and when I come back things are hoppin’! NASCAR, and on TV! Wow!! Tweets? & Parachutes? LOL You never know with David. DJA You may be going to NASCAR? Lucky you!!! Mt. nice article and quite timely. I think his trip to India gave him the determination to balance out his life. Cut out the unimportant. HI! I really love this article about balance. David is finding his balance and doing a terrific job! Just a quick note as I head out the door~~ Orla Fallon was absolutely, positively amazing and awesome last night!!!! So glad we went. She is gorgeous, witty and very entertaining. I would recommend her tour show to any of you. MUNK, Ripcord Music Publishing? Hmm… interesting. Hmm… still waiting for the vlog, too. I wonder if he’ll wait until after NASCAR to make it. it’s gonna be 90 degrees in north Texas tomorrow, and I am having a garage sale.I hate garage sales. Good timing….yesterday was in the 70’s. I am gonna fry. David, are you jumping out of an airplane today?? Maybe you should try bungee jumping first. oooh,either way, they would have to push me out. 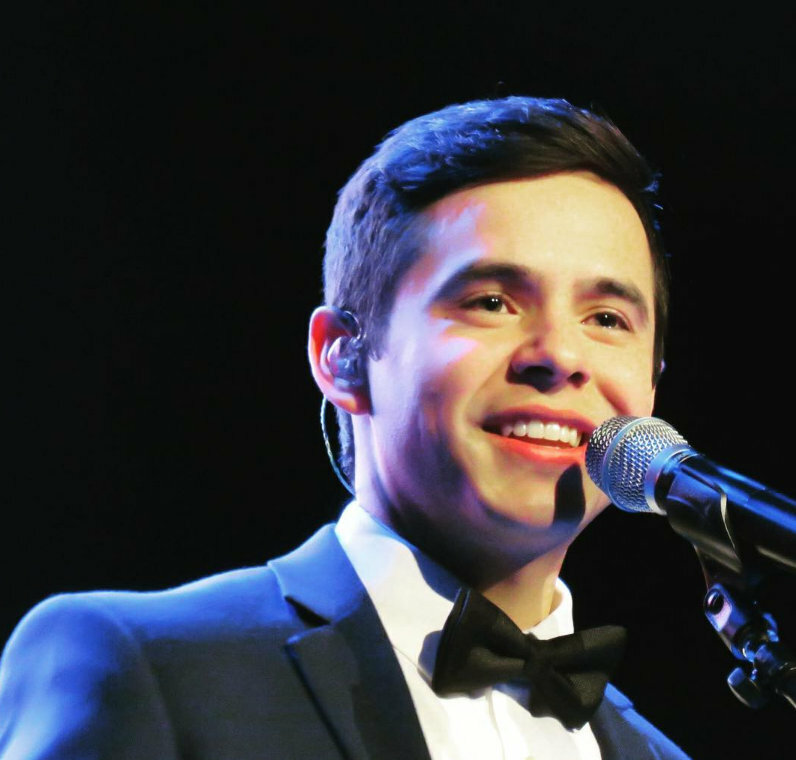 Saw this on FOD —JustinTV is a place to watch David sing NA –or its on ESPN at — 2:30PDT or 5:30 EDT Saturday March 26th. Hmmm–Out for a stroll eh? Glad to hear that David–who knows, you could go around the corner and –maybe–“your kind of perfect” would be out walking the dog! No bike? Bummer Makes me wonder –if a person knew addresses how many bikes would have been delivered by now– haha– he probably could have started a bike store. But, knowing David, some charity would have a bunch of happy kids! Can you tell it’s a boring Saturday where I live–Dullsville. But, that’s OK I have the ambition to go with it. I’m not a NASCAR fan, so I’m very happy that the NA is sung BEFORE we have to watch a bunch of cars go in a circle a hundred times before we get to hear David. 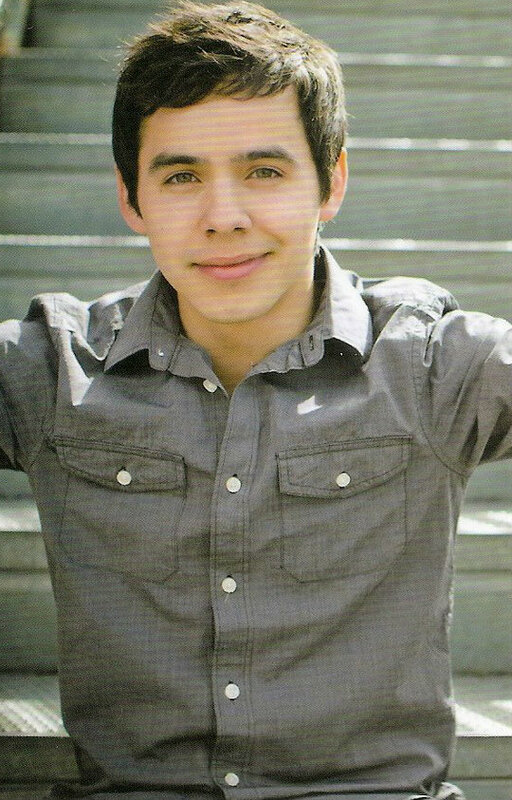 SAN BERNARDINO COUNTY, Calif. (March 24, 2011) – Auto Club Speedway announced today that American Idol Season 7 finalist David Archuleta will perform the National Anthem prior to the start of the Royal Purple 300 NNS race atAuto Club Speedway on Saturday, March 26. Archuleta’s rendition of the National Anthem and the Royal Purple 300 will broadcast live on ESPN at 2:30 p.m. PT. 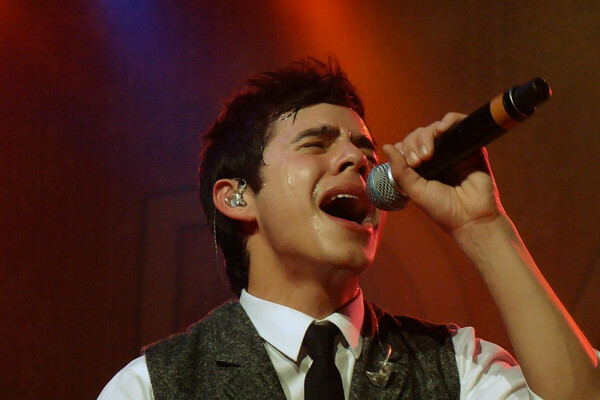 Following American Idol, Archuleta released “Crush,” the first single from his self-titled debut album, which charted at No. 2 on the Billboard Hot 100 the week of its 2008 release and has since sold over two million downloads. 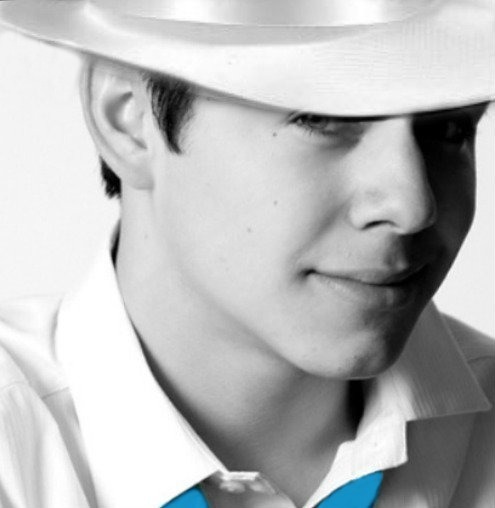 In 2009, Archuleta released “Christmas from the Heart” which debuted at No.2 on the seasonal chart behind Bob Dylan. His highly anticipated sophomore album “The Other Side of Down” was released in October 2010. 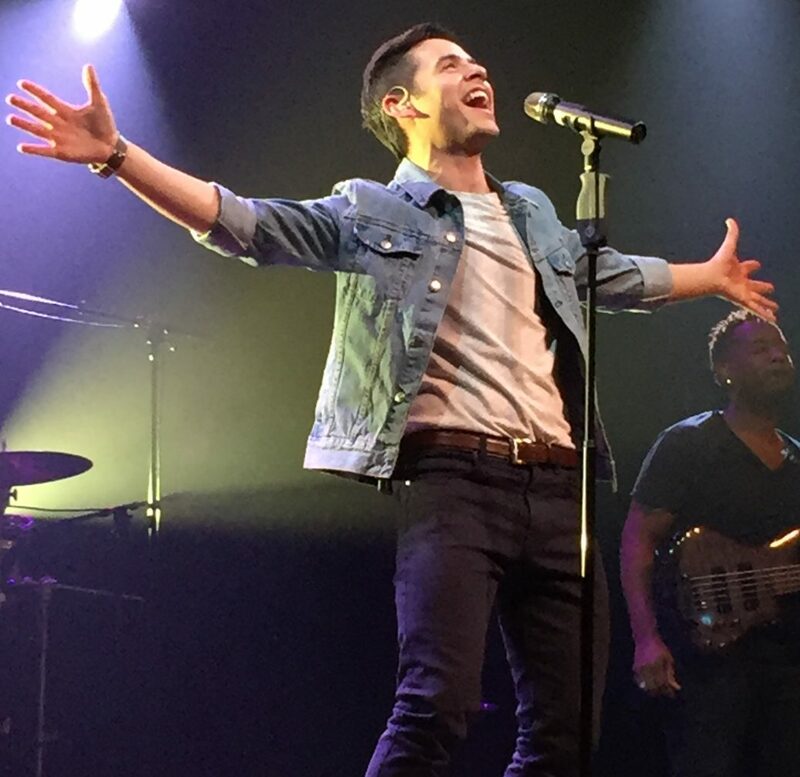 To see David Archuleta live at Auto Club Speedway, tickets to the Royal Purple 300 NNS race on Saturday, March 26 start as low as $30 and AAA members receive Show Your Card & Save discounts. For more information or to purchase tickets call 800-944-RACE (7223), log on to http://www.autoclubspeedway.comor visit the Auto Club Speedway ticket office. About Auto Club Speedway Look for some amazing racing when the NASCAR Sprint Cup Series returns to Auto Club Speedway for the Auto Club 400 on March 27. After October’s NSCS race, drivers, media and spectators proclaimed that race as possibly the best ever at Auto Club Speedway- five-wide racing at over 200 mph on the NASCAR circuit! Auto Club 400 tickets start at $35 and AAA members receive Show Your Card & Save discounts, including a special section with half-priced tickets for kids 12 and under. And don’t forget children 12 and under can sign up for the FREE Auto Club Speedway Lefty’s Kids Club membership to receive FREE admission on Friday and Saturday. For more information or to purchase tickets call 800-944-RACE (7223), log on to http://www.autoclubspeedway.comor visit the Auto Club Speedway Ticket Office. Never having been a “fan” of anyone I have no clue. I just don’t understand those that say they’re moving on, well that’s not a fan in my book. As for me I’ll wait however long it takes. 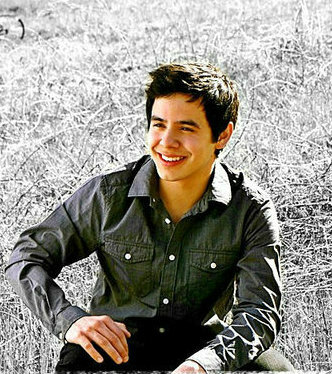 David Archuleta One of the youngest participants on American Idol, David Archuleta was only 16 when he placed second on the seventh season. He comes in at number eight on our list with over 968,000 album sales and 3 million track sales. David’s tweets! Strolling and eating tamales de pina. Fredric M. Bronson (born January 10, 1949) is an American journalist, author and writer. He is best known for the weekly “Chart Beat” column in Billboard magazine, and as the author of books related to Billboard charts. Josh Skinner (full name: Joshua David Skinner) is an American actor host producer, and songwriter. As of 2010, he lives in Los Angeles, California. As a songwriter, Josh’s work has appeared on Sara Lumholdt’s album debut (of A-teens) and Spanish actress/singer Alessandra Rosaldo which he has co-written five songs for new Spanish album and English debut. Her first crossover in the English market will be Josh’s song “Breathless.” He has worked with Jeff Timmons (98 Degrees) and Kimberley Locke (American Idol). Tamales de pina are delicious, check them out! Also, I read an article in the newspaper today from the US Census for 2010 which said the Hispanic/Latino population has surpassed the growth for all other Ethnic groups in the US. I bring this up because David has an opportunity to tap into this large, typically musically oriented culture. The time is ripe for David to record that Spanish album he has said he wants to record “someday”. I would bet the majority of “our people” do not know David, & those who have heard of him, may not know he is Latino and can sing in Spanish..oh so well, which is an understatement! I don’t know what the Latino music producers are waiting for? They have a beautiful, gorgeous, Latino STAR, in their midst. What more proof do we need? David, Tu eres muy guapo, lindo, prescioso, y muy elegante! Lets not forget this either. El mas bello de todos. #53 Silverfox, HI! oh..I didn’t remember about LadyV! Good thought. Just thought it was interesting cuz of what Eman said. Just happy that David is busy with building his career. I would love love love for him to do a spanish album! Can’t wait! and thanks for the awesome videos! gosh …..he is good! Thanks SF #53 and Dja #55–Don’t understand Spanish–but don’t have to just need to understand Davids passion. For some unknown reason I really like ” No Me Queda Mas”. Not to change the subject from Spanish– I just thought we could use a little patriotic song to get us ready for tomorrow. Hey, DA! I got some old videos I’ll be happy to share with you. I’ll even make popcorn and…. all right…. you talked me into it….. buy some of those corn chips. What!!? You want salsa? (mumble, mumble). See? He LOOKS all sincere and caring! pshaw. I’m not buying it. Nope, never. Not doing it. Not going there. Not caring. Not watching. He never “made me look”. Or “made me stare”. And Spanish? You would think that mellow, watermelon-ish, mouth-watering, eye-melting, ear-swimming, heart-drowning sound that comes out of his mouth when he makes himself all “latin” … well … you would think that might have an effect on me. This is what you are doing for David…the ‘videos’. They are right out in the forefront. New fans, established fans, people checking out the sites, people who know people, making more contacts. There is nothing any greater that one can do for David right now and SF and some others have been bringing these out in the open during important times. Times where maybe new people need to see what has gone on over the three years. People don’t have to read or debate or try to understand anything because this is for David. These two songs ‘Somos El Mundo’ and ‘Contigo en la Distancia’ are examples of what David can do, they are fantastic Spanish songs and remind people everywhere how great and exciting a CD in Spanish album would be. David has a tremendous selection of videos and in four languages. There is no other singer anywhere who can compare. There can be a plan to help with promotion, as sites are in the public’s eye. Thanks for the videos!! Can I just add. David please don’t wait for 12 Spanish songs for an album. How about a single then a 4 song EP to get us and others started. Please! Nice to see you back SB. All this talk of Spanish singing! Why must you torture me so? Whatever shall I do? Latino shoulders. How dare he? A whole CD of Spanish? concerts? videos? It’s all too much! There is no hope for me. The slight grip on reality that I now have is so strained. I am one nostril flare away from disaster! MT; Thank you for your thoughtful post as trying to maintain a balance in this hectic world is something relevant for me as well. There seems to be alot of different options to keep David in the public eye … I can only hope his creative team will capitalize on them. 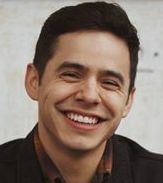 For what David has accomplished in his young life, having juggled many responsibilities and making some sacrifices along the way, he has done an amazing job of balancing his life thus far while remaining true to who he wants to be, unspoiled and seemingly undisillusioned despite the ups and downs of a competitive music business. My sense is that David does understand the importance of staying connected with his fans and that in due time we will see the rewards of his methodical, diligent and thoughtful building process, surely an empire in the making. Admittedly, a more visible and communicative David will soothe any anxiety or worrying about his career and keep his fans anchored firmly. Skydancer1x, #39; Photo of P&A is just too precious! Djafan, #51; From those tweets and recent ones, it seems to give a glimpse on how David is keeping his connections alive and how well respected he is. Hope that you’ll get to see David sing at tomorrow’s NASCAR race! Silverfox, #53, SandyBeaches #60; I love David’s part in Somos El Mundo Por Haiti and in reading the listener’s comments, it seems that there are quite a number of people that didn’t even know who David is. Just think, with a spanish album and the latin media coverage that it would garner, there is a whole new audience and potential worldwide fanbase to expand on! Latin shoulders. hmmmm…..Yes those are some dangerous shoulders when he gets into his Latin self. I’m with you on wanting the Spanish album leaked incrementally by EPs of 4 songs, say every 4 months before the whole album hits. I have already stated in the past that once that Spanish album comes out I will have to take time off from work. I will be a useless, incoherent thing for days. Not even kidding people. He better not deliver that whole baby all at once. You think I’m kidding? Be afraid. Be very afraid. I am partial to ‘labios’. That soft ‘b’ just about does me in! Bluesky, your way with words is really something. Heidijoy, eps for the win, in small doses so we can survive. SF, It has to happen, just has to. The Latin community is ripe for the taking. 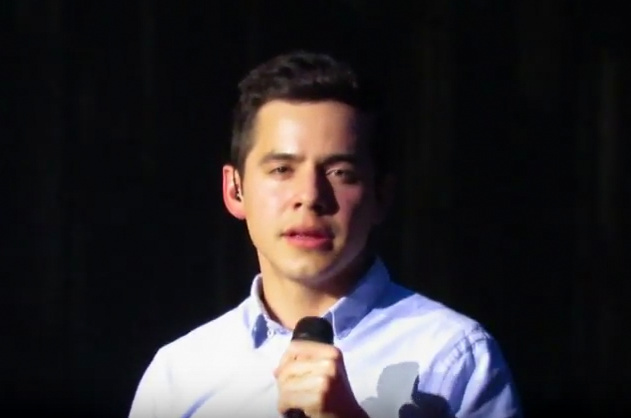 SB, I love that the videos get posted because they are the best promo for David, just David and his amazing gift. Dak, When I heard the mariachi when I first saw the video I figured it wasn’t David’s turn yet and then David came out, let me tell you my heart skipped a beat. I never imagined David singing with a mariachi, it takes a special skill and sound to sing, and that breaking in the voice you speak of is perfect for it. We’ll probably never know how much he’s gone through and just the thought of it makes me crazy. I’ve made plans to go tomorrow if all turns out like planned. Ever think of doing stand up comedy? You had me in stitches tonight! Too late to search for the lyrics. It’s a long shot; it’s probably a Spanish word. Will find out tomorrow. Son By Four, is the name of the group are from Puerto Rico and are 4 members. And the song of purest of pain (a puro dolor) is part of album of the same name, is the first track. I have to see you it’s all that I’m asking. david sings only one verse, and then make a free version. Gonna go set my tivo and do some spring cleaning till then. ciao! Great chat last night! Thank you Gladys and all the amigas!!!!!! I’m going today to NASCAR !!!!!!!!!!!!!!!!!!!!!!!!!!!!!!!!!!!!!!!!!!!!!!!! I noticed that there is some sort of pre-show at 2pm (my time) so I am recording that too just in case they mention David. Have a blast! So happy for you!!! Or, “beep-beep” in honor of NASCAR! dja, have a great time! Are you staying for the race or leaving after the NA ;). LOL I doubt you’ll be alone. David at the Long Beach airport on facebook! If one of the adms can copy and bring over I’d appreciate, getting ready to leave! Bluebar, Whoa! Another event on Memorial Day! Appreciate the article! Hmm…How did he get that gig? Maybe new mgmt. My ESPN station says there’s a pre-show half an hour before the NASCAR event. Perhaps that’s where these pics are from? Emmegirl, Djafan said she’d keep in touch with us and as of last night she was just staying for the SSB but that can change. Heh! Edit: Dja just texted. She’s on her way! ok, attempting to travel incognito. Not sure I will survive a 2nd watch on that blog! EXTREME close up? GAH! And that is how it’s done folks – simple, straightforward, with feeling, and just gorgeous! Take note singers of the world. Good job !! David –We now know your voice can’t drown out F-18 Hornet– Rats–Gotta love those jets though. 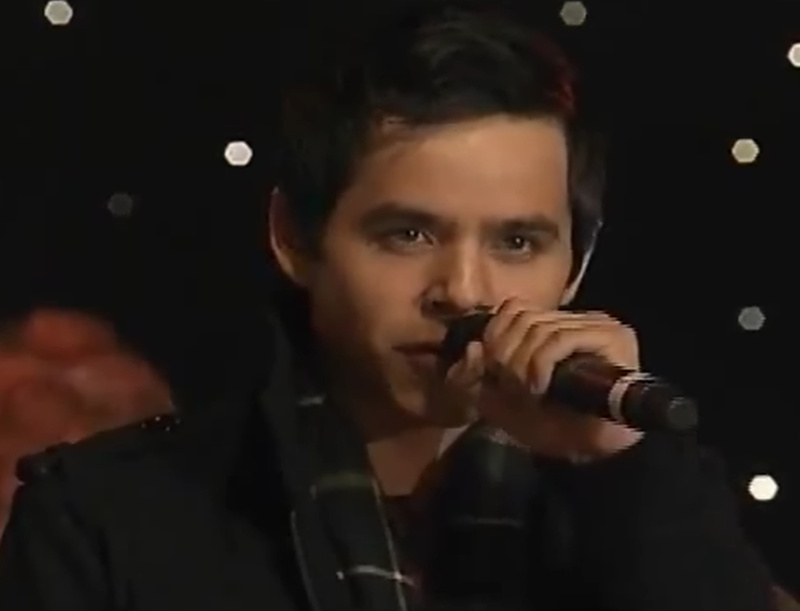 Twitvid for all those who missed David’s awesome performance! Our good friend Refnaf has an announcement! Hope you all get a chance to check out my website http://www.thornbushdesigns.com and bookmark it for when you may need a gift for a mom, sister, friend in your life, or a treat for yourself 🙂 Visit me on my blog and let me know what you think!! I will be continuing to add new pieces as I create them, so take a peak often!!! Thank you all for your friendship and support!!! David is having himself quite a week -plus! Can you imagine being ushered around the event VIP style, getting to ride in the gray cars ( which aren’t going 25 MPH) looking behind you to see all those famous drivers and cars following you. Pretty cool!! Hey, I’m an old lady and I think its way cool. Check out TOfan’s great article with many tweets about David being at the race today! Thanks TOfan for doing all that homework. David was beyond amazing, his voice was strong, rich, just perfection. I was at the bottom set of bleachers and watched while they introduced him, Ringwald, Mandel, and all the race car drivers. The car drivers shook hands with David and the rest. When David stepped of the stage while they did more introductions and was immediately surrounded by people on the ground surrounding the stage including the drivers asking David for a picture. 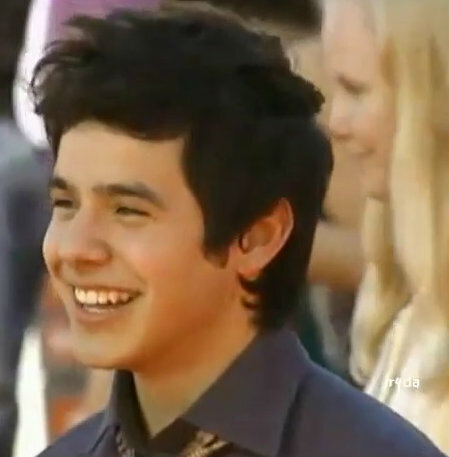 David took pictures and signed autographs until he was led back to the stage for the NA. As he waited you could here the screaming of fans trying to get his attention, David! 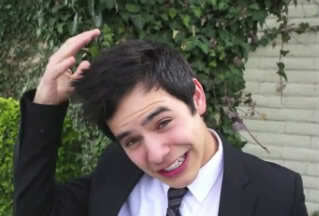 David I love you! He waved and smiled, at one point the ladies next to me got his attention and he turned to us and waved, I waved like a lunatic, lol. David sang and I heard the most beautiful sound ever. I know I saw in December twice, but darn it was so good to see him. Off the stage he went again and once again he was surrounded and was then escorted to the center of the race track were the pictures and autographs continued. Some gray cars pulled up behind him and all the others and was I surprised to see him get in the front passenger seat of one of them while Ringwald and Mandel got on the others. They took off around the track, pretty fast and waved as they passed the stands, the race cars followed behind. David jumped out the car looking mighty excited. He stood there while people continued to take pictures. When the race started he clapped and jumped watching the cars go round the track. And then after watching a few laps they led him off to the buildings where there were indoor viewing areas, probably where he did the vlog from. I’m so proud of David and by the response there he sure draws a loving crowd. 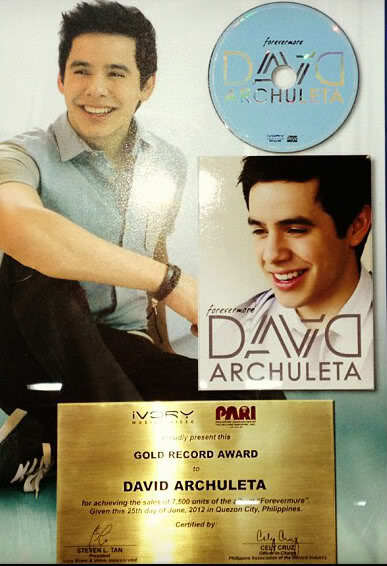 So happy for you Djfan and of course for David too!! Thanks for sharing your experience with us. Dja, so happy we had an insider there. Thanks for going and giving us the goods. Sounds like he got lots of love. Dja, thanks for sharing with us. I’m so happy you were able to go see and hear him in person. Today was a lovely day!!! Now, where are those tour dates. 🙂 I need me some DA live!!! That face, that face, that beautiful face! Can’t stop watching the new vlog! djafan, may I publish your “recap” on AFS? “but the way he lets his voice crack (if that’s even the right word) at the end of some words” <–Dakgal: the cracking of his voice is something I've always noticed & appreciated. 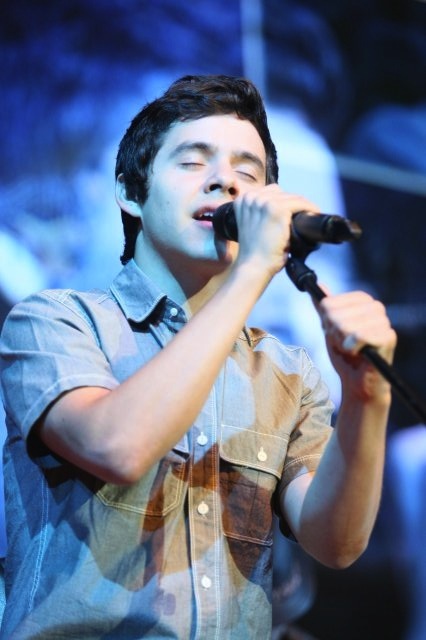 Sets his voice apart from other artists..shows his emotion/passion. I even heard it yesterday during the singing of the National Anthem. Heaven!